Exactly a month ago, Anchor Brewing celebrated 50 years since 27-year-old Fritz Maytag purchased the almost-defunct Anchor Brewery in San Francisco, saving it and an American beer style from oblivion. I have been remiss in acknowledging the milestone, because while I don't think Anchor qualifies as the spark that ignited what we now call the craft beer revolution (it took twelve years until the next American brewery was founded), it is nevertheless an important institution on its own, unique merits. Until sometimes in the 1990s, the United States was not much of a brewing country. Like so many other nations, we built it on the chassis of Bavarian lager brewing, slowly debasing it over the decades. We managed to embellish this tradition into a few minor styles, and among these San Francisco's steam beer is easily the most interesting. It is also a form of debasement, but in this case one that led to interesting, full-flavored beer. The shortcut that produced steam beer wasn't intended to weaken it in flavor or strength, but was a necessity of frontier brewing. It's a perfect example of the way styles emerge or evolve, and steam beer is an authentic American expression--if not one that fell very far from the Bavarian tree. 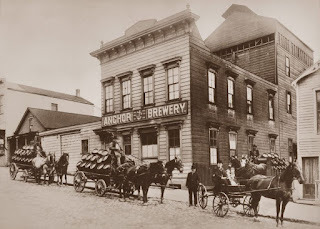 Anchor's greater contribution to American brewing was demonstrating that it could be done on a small scale profitably. I don't actually think Fritz Maytag's beer was what inspired other breweries, no matter how many people want to credit Liberty Ale with establishing the modern pale/IPA. Rather, like so many other San Franciscan immigrants before him, he demonstrated that making good, honest beer on a small scale was possible. It was a proof of concept. Even though Maytag sold the brewery five years ago, his name will always be written first in the list of brewers who helped reshape American brewing. And it all started 50 years and one month ago. In the second half of the 19th century, beer was really on the move. German immigrants were pouring into North America, dotting the towns of the Midwest and West with new lager, breweries. Pale lagers were streaming out of Bohemia and Austria across Europe. And in America, migrants were sweeping across the continent in search of better lives. One of the migrants’ prime destinations was San Francisco, where they heard the waters ran with gold. In 1848, it was the small hamlet by the bay, a community of fewer than a thousand souls. But by July 1850, census workers counted almost 95,000—a seething, sweating mass of dreamers and drifters. Franconian entrepreneur Levi Strauss saw them as customers in need of a sturdy pair of pants, and many of his countrymen figured they could use a beer, too. By 1900, the breweries were in place—two dozen at their peak—making a brew the locals called “steam beer.” Taverns bulging with hard-working, thirsty men meant breweries didn’t have the time to make proper lager. They brewed a beer with lager malts, generally (though not always) in the German decoction method, but instead of fermenting cool and conditioning the beer for weeks, they pitched lager yeast at ale temperatures, let the wort finish fermenting in wide, shallow “clarifying tanks,” and packaged it immediately, without any conditioning. The entire process took less than a week. Steam beer’s popularity suffered mightily with the arrival of refrigeration in the 1890s, which allowed breweries to make lagers even in warm places like San Francisco. It took a further hit with the 1906 earthquake and ensuing fires destroyed much of San Francisco. A bit more than a decade later, Prohibition came, finishing much of the work the fires didn’t. 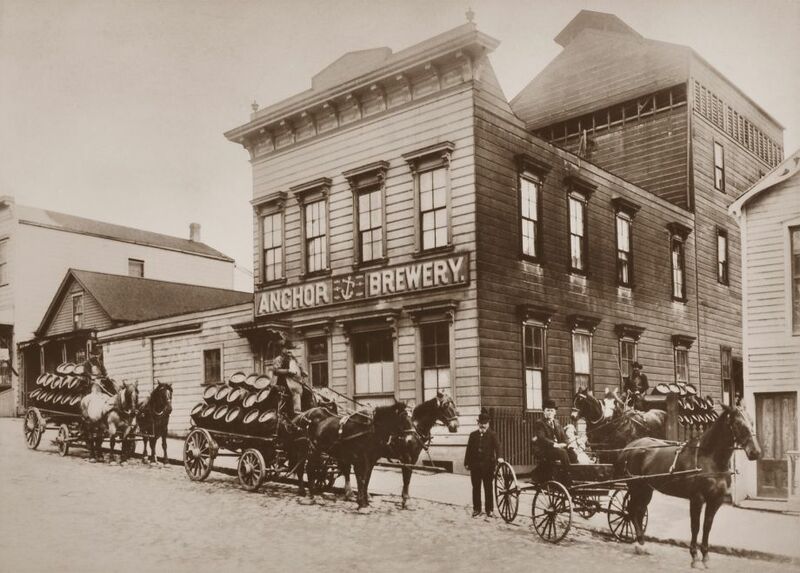 Following Prohibition, Anchor Brewing was the sole surviving purveyor of steam beer, and it limped along through more setbacks over the course of the next three decades until in 1965, facing bankruptcy, it planned to shut its doors. That was when Fritz Maytag, who had a bit of his family’s washing-machine money, stepped in and bought a controlling share of Anchor Brewing. He didn’t buy it outright until 1968, and he spent the intervening years learning the brewing art from colleagues like Bill Leinenkugel and studying Jean de Clerck’s Textbook of Brewing. In 1969, he bought new equipment and, armed with his new understanding of beer, retooled the recipe for steam beer. Over the years, Anchor had succumbed to the same cost-saving shortcuts larger breweries had adopted, and Maytag scrapped them all. He went looking for inspiration in the old tradition of brewing steam beer. would have done it, too. Nothing fancy, just simple, easy beer. That foaming thing in the wall is a grant. Old-timey stuff. Of major influence to craft brewers who followed: for years Anchor was the only US brewery producing all-malt beers. Fritz proved it could be done and that the results were worth the effort. Anchor Steam was my introduction to real beer. There was a bar down the street from my Berkeley dojo which opened after the owner got home from work each day. He always had Anchor on tap and none of my sweaty friends drank anything else. Totally agree that under Fritz, Anchor was indeed a pioneer. And it's nice that one of the first 'craft' breweries is still one of the best. Just a nitpick, though...Anchor was not the only US brewery making all-malt beer in the pre-craft era. In the late '60s and early '70's, the Rheingold brewery near West Orange NJ was brewing a revival of the all-malt Trommer's White Label lager, a brand that Rheingold acquired when it bought the Trommer Brewery. The revived White Label lager disappeared when Rheingold finally closed later in the decade).